First poster for 'Looper' hits the web! Looper, the upcoming action sci-fi from Brick director Rian Johnson, is a film that we're particularly excited about, so we were pleased to see the first poster revealed and it's looking rather cool. Anyone who has followed the film with a passing interest will be unsurprised to discover that the poster focusses on Joseph Gordon-Levitt and Bruce Willis, who play the same character, Joe, at different points in time. What makes us even more excited is the fact that they made Joseph Gordon-Levitt look a whole lot like Bruce Willis. Joseph Gordon-Levitt plays a hitman who whacks targets sent back in time from 30 years in the future, but he faces a brain-melting conundrum when tasked with offing his older self. See the poster and read more about Looper after the jump. Johnson has always subverted genre expectations, and we expect him to continue that with Looper. Here's hoping for a lo-fi Inception, with the same combo of cool concept and jaw-dropping execution.There's something in Gordon-Levitt's leather jacket that recalls Chris Nolan's sci-fi cranium-buster, and it's nice to see an action flick exercising subtlety in its execution (from the visual echoes between the two men, to the explosive detailing). There's rumors that we'd be getting a teaser poster sometime next week! So don't forget to come back and check it out. You can see Joseph Gordon-Levitt next in The Dark Knight Rises and Bruce Willis in G.I. Joe. 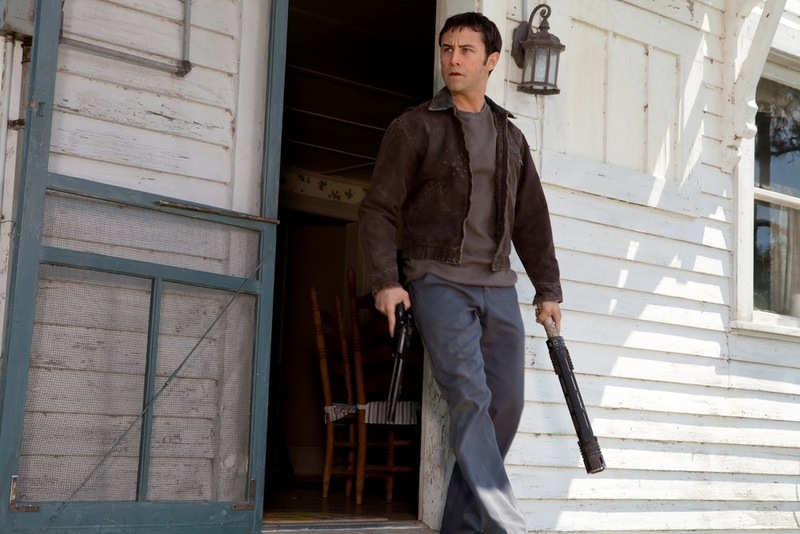 Looper opens in the UK on 28 September 2012. Impressed with the Looper poster? Pleased to see an action film one-sheet showing some restraint? Let us know! First Five Minuets of Lockout hits the web!